I almost do not know where to start about applique and the applique feet & options that we offer our Elna customers……there is SO much to say. 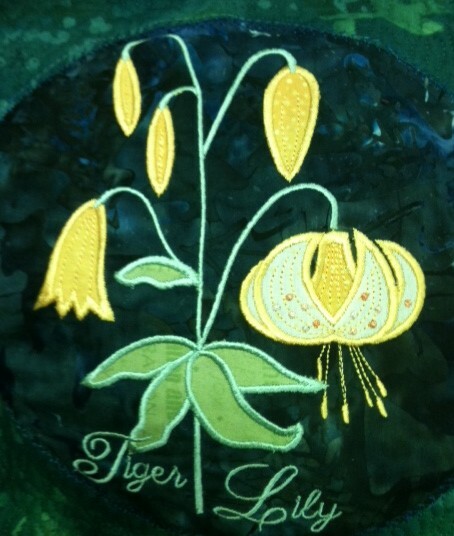 Wild flowers by Smith Street Designs – applique-in-the-hoop or I like to call it applique- the -super-easy-way! I really LOVE applique……I love how versatile it is as a means of adding texture and interest to many forms of sewing. And there are literally a dozen or more different techniques for achieving great applique results in our projects. 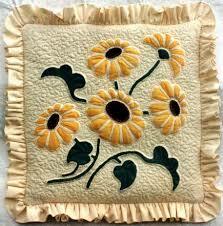 Applique is very well known and often used on quilts from bed quilts to wall quilts to table runners & more. Applique is also very pretty and practical when added to clothing – babies, children and adults. NOTICE HOW PERFECT & NEAT THE APPLIQUE STITCHING BECOMES WHEN YOU ALLOW THE EMBROIDERY MACHINE TO DO THE WORK FOR YOU!! 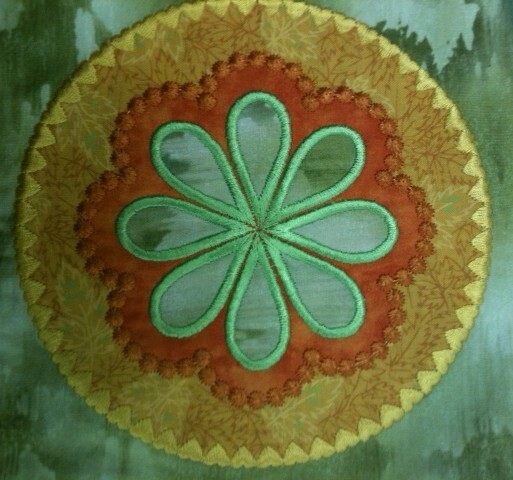 This applique involved 3 layers: first the gold, then the orange & finally the green on the top. Perhaps we can cover the topic of the many & varied techniques we can use to make appliques in another blog post or series of posts? Is there any interest for this? I have lots prepared on this topic and would be real happy to share it with you. Send us a comment if you would like to see this. Suffice to say at this point that applique can be applied by hand, or by machine OR (my favourite) in-the-hoop. I find that if we can let the embroidery machine actually do the work of the applique for us, the results are so neat and the effort is in the selection or digitizing of the applique embroidery design rather than in the many hours spent holding my tongue in just the right spot in my cheek to go around the applique shapes neatly & evenly! APPLIQUE-IN-THE-HOOP This embroidery designs is from the WILDFLOWERS Collection by Smith Street Designs. There are accessory video’s available on line for many of the feet shown below. Do a search on http://www.janome.com with the words: accessory video’s & this will lead you to them. Highly recommended that you watch them as they are most informative and helpful to you if you wish to get the most out of your ELNA SEWING MACHINE and accessory feet. 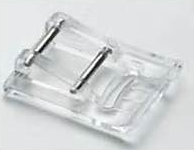 THE APPLIQUE FOOT This foot is available for both 7mm (Part # 202023001) and 9mm (Part # 202086002) machines (This would be the EL730; EL760, EL860 – & all 9mm machine models). Please note that there are TWO metal bars which need to be attached to the machine so do follow the package instructions to ensure you attach the foot correctly to the foot holder/ankle on the machine. The beauty of this foot is that it is short & stubby so makes it real easy to turn corners or applique along uneven & curved appliques. It does not have an open toe but is clear plastic so there is visibility of the stitching. 2. 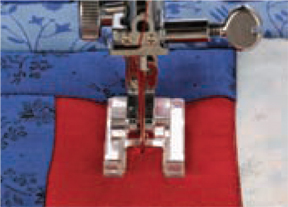 THE SATIN STITCH FOOT F AND F2 .Many of us like to use the Satin stitch foot when we do applique stitching – especially the Satin Stitch foot F2 which has an open toe so that it is easy to see the placement of applique stitching as you sew. These feet are both available for 7mm and 9mm ELNA MACHINES. Please check out the links and/or ask your local ELNA dealer about purchasing these feet. Just an FYI: quite a few of our midline & higher sewing machines include one or both of these feet as standard accessories. 3. THE ACUFEED OPEN TOE FOOT This foot is available as an optional accessory for the EL 7300 & EL740 models only. Part # 846410003. 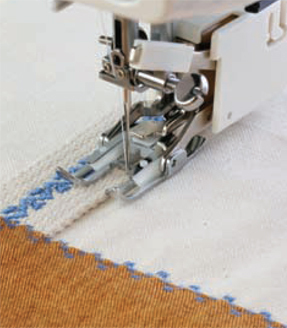 The open section at the front of the foot allows for easy viewing of the stitching & edge of applique fabric AND the ACUFEED features of this foot enable feeding of the fabric from the top as well as the bottom. This can be especially important if the applique stitching is being done through layers of fabric and/or is being combined with quilting – yes, many of us like to “kill 2 birds with one stone” and applique around a shape simultaneously with quilting through the layers. 4. 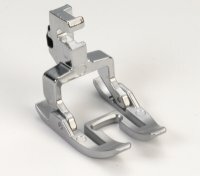 THE ACUFEED FLEX OPEN TOE FOOT This foot is also an optional accessory to add to the ACUFEED FLEX FOOT HOLDER DUAL PRONG OR TWIN that is a standard accessory on our ACUFEED FLEX model machines. 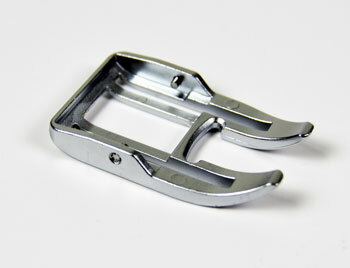 This foot is for 9mm machines only that have the Acufeed Flex system: EL730; EL760. The part # is 202149004. The comments in #3 above apply here as well. 5. THE WALKING FOOT WITH OPEN TOE For ELNA machine models which use the alternative (white screw-on) walking foot option, there is an OPEN TOE walking foot that can be very useful when doing applique. The part # is 200388006. This would be for 7mm machine models only. There is a walking foot for 9mm models such as the EL860 – this part # is 2022133005: the Convertible Evenfeed foot set for 9mm machines. This does NOT apply to Acufeed Flex models as they have their own Acufeed system which is different. This entry was posted in ELNA 7300 SEWING MACHINE, ELNA 760 EXCELLENCE, ELNA 860, ELNA EL730 EXCELLENCE, ELNA EL760, ELNA IN CANADA, ELNA QUILTING MACHINE, ELNA SEWING ACCESSORY ATTACHMENTS, ELNA SEWING ACCESSORY FEET, ELNA SEWING MACHINE, QUILTING PROJECTS WITH ELNA, SEWING FUN WITH ELNA and tagged ACUFEED FLEX OPEN TOE FOOT FOR 9MM MACHINES, Applique, APPLIQUE FEET FOR ELNA, APPLIQUE FOOT, APPLIQUE IN THE HOOP, Applique with F2 foot, Elna Open toe applique foot F2, OPEN TOE ACUFEED FLEX FOOT FOR 9MM MACHINES. Bookmark the permalink.